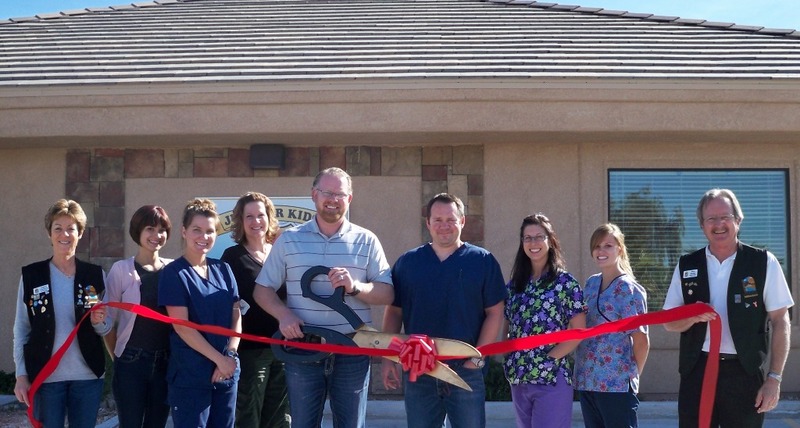 The Lake Havasu Area Chamber of Commerce Ambassadors held a 1st year anniversary ribbon cutting for Just for Kids & Families Dentistry at 80 South Acoma Boulevard #D-100. Just for Kids and Family Dentistry offers dentistry for the entire family. Services provided include; nitrous oxide, sleep dentistry, lap exams for toddlers, special needs, implants, dentures, cosmetic dentistry, crowns, bridges and discount dental plans. Most insurance accepted including AHCCCS. Pictured from left to right are as follows; Chamber Ambassador Virginia Chambers, Maria Schaefer, Jennifer Lentz, Michelle Bliss, Ryan Porter, Brett Chapman, Amber Kramer, Jennifer Oxley and Chamber Ambassador Steve Bentley. For more information call them at (928) 855-7717.